12:37 today's volume at this point in the day is much lower than yesterdays'-the holiday effect. I'm going to call it a day. See you next week. Take a course or two. Have a great Memorial Day. 12:27 here the 110 EXMA has flattened out above a rising 440. So the 20 EXMA may get tangled with it. and has been all day. That is why I was not interested in a sell on the first trade. 9:57 Sentiment a bit better than expected. There is a link to economic reports on the left side of the ListOfCharts page. 5/27/2011 9:06:04 AM MT mm****:: Let's hope they push it to the next R level, which is 1336.75. 5/27/2011 9:03:10 AM MT LEM:: This is why trading the moving averages is so frustrating. Back and forth trading with little result and maximum energy use. 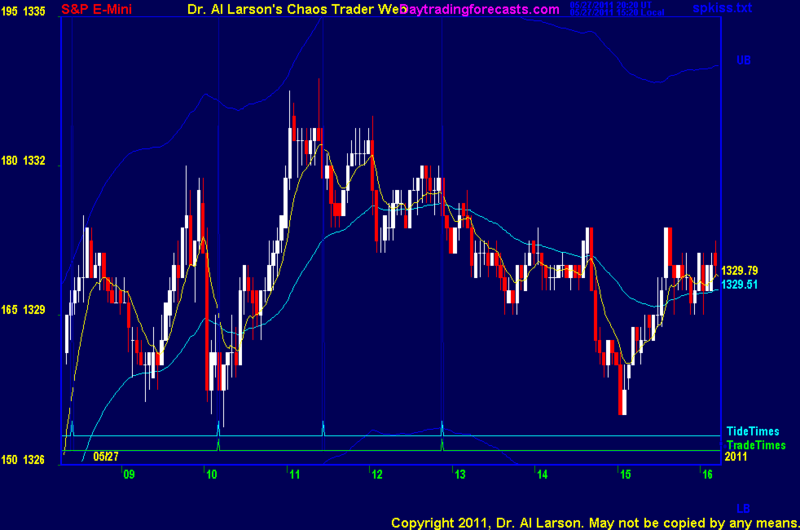 5/27/2011 9:02:09 AM MT LEM:: Following the rules, traded short at the TWindow within 2 points of the 110MA. The rules say nothing about head fakes. 5/27/2011 8:37:31 AM MT LEM:: My sister is still hoping that my father's widow will release his ashes for burial at Arlington. 5/27/2011 8:36:22 AM MT LEM:: The 13eMA is above the 27eMA but the 22eMA and 110eMA are crossing and recrossing. Very confusing. 5/27/2011 8:32:40 AM MT LEM:: Could use some more insight on the term "continuation buy"
5/27/2011 8:14:13 AM MT LEM:: Xover of moving averages say go short. 5/27/2011 8:01:14 AM MT LEM:: After many years of estrangement, we reconciled before his death at 91. At a visit in Florida, I asked him a question that I had always been meaning to: "Why did not not serve in the European Theater in WWII since you spoke German and are of German heritage." He responded " NO WAY, I didn't want to serve in some back room intelligence capacity. I wanted to FIGHT". He went on to say how ironic it was that as infantry he not only survived but the only physical injury he ever had was from a mishap in training. 5/27/2011 7:54:32 AM MT LEM:: My father Colonel Arndt Mueller, served in Vietnam.